With advancement of technology, the data load has been increasing three dimension-ally in terms of velocity, volume as well as variety. Managing as well as quickly accessing such huge data bases require evolving technologies. The SAP HANA In-Memory Database is one such solution to managing such huge databases. 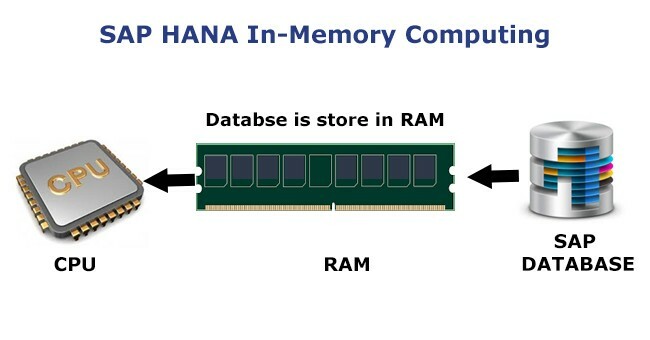 What is SAP HANA In-Memory Database? As the name suggests, the In-Memory Database uses a technology wherein all the data collated from the source system, instead of being stored in cumbersome hard disks is stored in a RAM memory. In SAP HANA, the technology of In-Memory Database is used to store huge databases in a manner that whenever required for analysis or information processing, the data can be accessed by the CPUs within nanoseconds. Why is the technology of SAP HANA In-Memory Database so important for businesses? A technology like the SAP HANA In-Memory Database helps in removing information latency as it gives instant access to huge data pools for calculations and references. This technology gives access to the most updated and latest information so that strategies can be planned based on the latest insights and trends. Quick access to essential data gives businesses a competitive advantage as quick access makes way for quick calculations and informed predictions. The SAP HANA In-Memory Database can read memory data in 5 nanoseconds as compared to the conventional databases that take about 5 milliseconds to read such databases. The row based, column based and object oriented technology is combined in this database. Parallel processing with multicore CPU architecture forms the basis of this database. How does In-Memory Computing give a competitive advantage to the HANA platform? Companies in need of real time data for precise business prospecting prefer the SAP HANA In-Memory Database as this technology helps in eliminating information latency. The cost of Data Storage decreases considerably with In-Memory computing as storage of data does not require the mechanical disks which are not only expensive but slow too. The column based storage of In-Memory computing makes data compression seamless and all the more precise, thus further saving storage space. The use of multi-core CPUs further adds to the advantages offered by memory based storage. The fall in memory prices in the current market is a key factor contributing to the growing acceptance of in-memory computing technology. This has made in-memory computing inexpensive when compared with a wide variety of applications. Thus, it can be concluded by saying that when it comes to data processes and analysis, in-memory computing tools such as SAP HANA promise to deliver a step change.